History of the Pipe Organ — Learn more about the fascinating history of the organ. Photography by Ken Stein — This photography website is a joy for anyone who loves pipe organs. PipeOrgans.com — This site offers lots of good information on many topics related to pipe organs. TheaterSeatStore — This site offers information on the origin of the theater organ. The Theatre Organ — More information about theater organs. Organ Historical Society — This organization promotes a widespread musical and historical interest in American organ building through the collection, preservation, and publication of historical information, as well as recordings and public concerts. American Institute of Organbuilders (AIO) — This professional association is made up of organ builders and technicians from all over the United States and Canada. 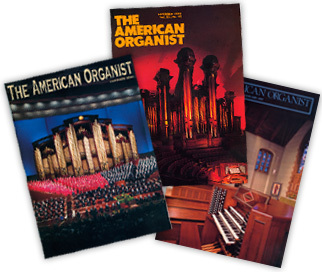 American Guild of Organists (AGO) — This national organization for organists has more than 20,000 members. The website includes many valuable resources, including a great introduction to the pipe organ. Nashville Chapter of the AGO — This is our local AGO chapter. The Organ Magazine — This magazine's website contains reviews of concerts, music, and CDs, as well as articles and extensive links. Pipedreams — This NPR radio show features lots of organ information. PIPORG-L — This electronic mailing list is dedicated to the discussion of a wide range of organ—related topics.